Now 37 years of age, Phillips is well removed from his days as a stalwart performer with the Reds. He topped 120 games for the 12th straight season — and topped 140 for the 11th time in a dozen years — in a 2017 campaign split between the Braves and Angels. But Phillips didn’t sign on with the Boston organization until late last June and ultimately appeared in only nine contests at the game’s highest level. Phillips didn’t exactly thrive in his brief MLB time last year, though a 27-plate-appearance sample isn’t much to go on. He was strong at Triple-A, turning in a .302/.348/.477 slash with four home runs over 161 plate appearances. And Phillips was still capable of near-average offense in the majors in 2017, posting a .285/.319/.416 slash in 604 trips to the plate. That ’17 effort wasn’t far off of Phillips’s career mean. Trouble is, he’s no longer an elite defender at second base. Though UZR graded him as approximately average at the position in his most recent full MLB campaign, DRS assigned a well-below-average -7 score for the second consecutive season. Phillips has also posted some notable negatives in the baserunning arena, though he’s still capable of stealing a bag. Phillips’s low-walk, high-contact skillset could still hold appeal, particularly to a team that still believes in his glovework. The grading systems were neutral to bullish on his 218 innings at third base in 2017, the first time he had ever played there in the majors. Phillips is no shrinking violet; his occasionally brash presence might not be for every team but could be seen as a bonus in the right circumstances. It isn’t apparent what kind of opportunity Phillips is looking for. He says he’s staying in shape, but there’s no indication of his preferred timeline. Phillips showed last year that he’s willing to undertake an extended run in the minors, though he surely did so knowing there was a chance at an important role for a championship contender. Whether he’ll be able to secure such an opportunity this time around remains to be seen. The Red Sox will call up infielder Brandon Phillips and third baseman Rafael Devers from Triple-A Pawtucket on Tuesday, Pete Abraham of the Boston Globe was among those to report. The team will need to add Phillips to its 40-man roster before promoting him. It currently has one open spot. Although Phillips has been a quality major leaguer for most of his career, the longtime Red was unable to land a contract in the offseason, thanks in part to his age (37). Phillips finally inked a minor league deal with Boston toward the end of June, and he’s now in line to appear in the majors for the 17th season in a row. Phillips was superb as a member of Pawtucket, with which he hit .302/.348/.477 in 161 plate appearances to earn a September call-up. He’ll provide second and third base depth for Boston – which, despite its overall dominance this year, hasn’t gotten great production from either position. Devers is partially to blame for that, having slashed just .242/.298/.422 with under 1.0 fWAR in 423 PAs. The promising 21-year-old has also been on the DL on multiple occasions because of hamstring troubles. Consequently, he hasn’t suited up for the Red Sox since Aug. 15. Given his status as a pending free agent, center fielder Adam Jones is an obvious trade candidate for an Orioles team with no hope of competing this season. However, as a 10-and-5 player (10 years of MLB service time, five in a row with the same team), Jones would be able to block a trade anywhere. The 32-year-old spoke about his future Friday, saying (via Roch Kubatko of MASNsports.com) that “it’s my family’s decision.” Jones noted that back when he signed his $85.5MM extension with Baltimore in 2012, he was able to make the decision himself. But now that Jones has a family, they’ll have a major hand in how his career plays out going forward. Whether the Jones family will have to make a key choice on the player’s future in the next couple weeks will depend on if the Orioles find a taker for him via trade. So far, the O’s haven’t approached Jones about his 10-and-5 status, Kubatko reports. In further unfortunate news for the Red Sox’s staff, knuckleballer Steven Wright’s recovery from left knee inflammation is “taking longer than expected,” manager Alex Cora said Saturday (via Christopher Smith of MassLive.com). Wright, who went on the DL on June 26, is continuing to deal with soreness in that knee – which he had surgically repaired in May 2017. As a result, the Red Sox will have to continue awaiting his return. When healthy earlier this season, Wright notched 40 innings of 3.38 ERA ball and a 53.2 percent groundball rate, though he also posted underwhelming strikeout and walk rates (6.98 K/9, 4.5 BB/9). Blue Jays lefty Jaime Garcia, out since June 23 with shoulder tenderness, is nearing activation from the DL, Gregor Chisholm of MLB.com writes. He’ll work out of the bullpen upon his return, though, Chisholm adds. The demotion continues a disappointing 2018 for Garcia, whom the Jays signed to a one-year, $10MM contract over the winter. Long a solid back-end starter, the 32-year-old has put up a 6.16 ERA in 61 1/3 innings this season. Back to Boston, which promoted veteran infielder Brandon Phillips from Low-A to Triple-A on Saturday, the Red Sox’s top affiliate in Pawtucket announced (h/t: Jen McCaffrey of The Athletic). The 37-year-old Phillips, who signed a minors deal on June 27, collected 26 PAs at the Low-A level. He’ll continue trying to work his way back to the majors and serve as a helpful second/third base piece for the Sox. The Cubs “may have interest” in Blue Jays lefty J.A. Happ, per Bob Elliott of the Toronto Sun (Twitter link). Chicago’s rotation has a pair of notable question marks, as it’s not yet clear when Yu Darvish will be able to return to the mix, while Tyler Chatwood’s season-long struggles to throw strikes have been a well-documented issue. Happ has been most prominently linked to the Yankees and the Mariners thus far, though as a pending free agent on a clear non-contender, he figures to draw interest from a large number of clubs as the non-waiver deadline approaches. Happ’s two most recent starts haven’t been good ones, though as long as there’s no medical reason for the pair of ugly outings, that’s not likely to impact his trade value much, if at all. Brandon Phillips chatted with WEEI’s Rob Bradford about his opportunity with the Red Sox and the manner in which he remained motivated and ready to play even when interest was limited throughout the offseason and early in the season. The 37-year-old veteran notes that he’ll play anywhere the Sox ask of him and is hopeful of returning to the Majors and helping Boston toward — but also enjoys working with the team’s minor leaguers as he gets back into playing shape. “I was waking up at 5 o’clock in the morning in the Gulf Coast League trying to get my work in,” says Phillips, who worked out with Boston’s GCL affiliate before moving into game settings at the Class-A level. “They’re like, ‘Brandon, you don’t have to do this.’ I’m like, ‘Man, I’m here for this. I want to work out with those guys. I just want to get back in the feel of it.’” Phillips makes clear that he has no desire to hang up the spikes at any point in the near future and wants to win a World Series ring before even beginning to consider retirement. The Rays had a pair of scouts watching the Nationals’ Class-A affiliate over the weekend, tweets Jorge Castillo of the Washington Post. While most teams obviously send scouts to watch other clubs year-round, and other teams surely had scouts on hand at that game as well, it’s nonetheless notable at a time when rumors have been circulating that the Nationals could pursue a trade that would bring Tampa Bay catcher Wilson Ramos back to D.C.
Aroldis Chapman will likely be dealing with his current left knee issue for the rest of the season, Yankees skipper Aaron Boone said before yesterday’s game (link via George A. King III of the New York Post). Chapman has been playing through a minor bout of tedinitis in his left knee and was held out of yesterday’s game even when the Yankees found themselves with a late 2-1 lead. Boone explained that he wanted to stay away from Chapman and Dellin Betances, instead turning to David Robertson to nail down the save. With a doubleheader set for Monday, it makes some sense to give Chapman that extra day of rest. King also notes that the Reds, Rangers and Royals were all among the rebuilding teams scouting the Triple-A tilt between the Yankees and Red Sox’ top affiliates yesterday. Several contending clubs were on hand as well, though, including the Indians, Phillies and D-backs. 4:55pm: Red Sox president of baseball operations Dave Dombrowski tells MLB.com’s Ian Browne that Phillips will spend some time at the team’s spring complex in Florida getting into playing shape before reporting to Triple-A Pawtucket (Twitter links). Notably, the organization doesn’t view him solely as a second baseman, as Dombrowski notes that Phillips “can play a number of positions.” Ken Rosenthal of The Athletic, meanwhile, tweets that Phillips will actually be playing third base in Pawtucket when he gets there. 3:45pm: The Red Sox announced Wednesday that they’ve agreed to a minor league contract with veteran infielder Brandon Phillips. The longtime Reds second baseman had not signed with a team since the end of the 2017 season, so he’ll assuredly require some time to ramp up in the minors before he can be considered an option to join the big league club. Phillips is represented by ACES. Second base has been an issue for the Red Sox all season, as they’ve been without Dustin Pedroia nearly all year following offseason knee surgery. Pedroia did return briefly, suiting up for three games before landing back on the DL with inflammation and discomfort in his surgically repaired knee. Eduardo Nunez has shouldered the bulk of the workload at second base this season in lieu of Pedroia, but he’s struggled mightily, hitting just .253/.284/.350 through 272 plate appearances to date. Phillips, who’ll turn 37 tomorrow, isn’t the player he was during his peak, when he hit .280/.330/.449 with outstanding defense and above-average baserunning from 2007-12. That said, the three-time All-Star still posted a quite respectable .285/.319/.416 slash in 604 plate appearances between the Braves and Angels last season, delivering 13 homers and 11 steals. Phillips is a four-time Gold Glover, but his defensive ratings dipped in 2016-17, with both Ultimate Zone Rating and Defensive Runs Saved providing a negative valuation of his glovework. He’s also been inefficient on the bases, as evidenced by a 25-for-41 success rate (61 percent) in stolen-base attempts over the past two seasons. Still, he’ll bring some valuable depth to an area of weakness for a Red Sox club that still doesn’t know when, or perhaps even if, Pedroia will return to the Major League roster. Brandon Phillips was one of the many veterans unable to find a landing spot in free agency this winter, but the longtime Reds second baseman tells MLB.com’s Jon Morosi that he’s still holding out hope for a return to the big leagues (Twitter links). The 36-year-old Phillips notes that he’s open to platoon or bench roles, adding that he’s also amenable to bouncing around the infield and playing some outfield as well. Certainly, Phillips isn’t the All-Star-caliber player that he once was. While he batted .280/.330/.449 with above-average power and baserunning in addition to superlative defensive contributions from 2007-12, his overall output has diminished in recent years. Nonetheless, Phillips still posted a quite respectable .285/.319/.416 slash in 604 plate appearances between the Braves and Angels last season, delivering 13 homers and 11 steals. His defensive ratings did dip in 2016-17, with both Ultimate Zone Rating and Defensive Runs Saved providing a negative valuation of his glovework. He’s also been inefficient on the bases, as evidenced by a 25-for-41 success rate (61 percent) in stolen-base attempts over the past two seasons. While it’s unlikely that a club would add Phillips and plug him into a regular role in the near term, there’s still some potential value to be had. Phillips is perennially one of the toughest strikeouts in the league, even in recent years (11.5 percent from 2015-17), and has batted .290 over the past three seasons. That average hasn’t been artificially inflated with luck (.312 BABIP) and has helped him to get on base at a roughly league-average clip in that time (.322), even though he rarely walks. He’s also maintained a quality line-drive rate, including a 22.2 percent mark in 2017. On the other hand, Phillips has walked in fewer than four percent of his plate appearances in that three-year run, and his power has dropped from the aforementioned 2007-12 peak. While it’s true that he still hits an above-average share of line drives, his overall hard-contact rate is below the league average, and he didn’t rate well in Statcast metrics such as exit velocity and barreled-ball rate. In fact, at a time when the general thought process throughout the league seemed to be to hit the ball in the air and focus more on launch angle, Phillips posted a career-low 28.3 percent fly-ball rate — one of the lowest marks of any qualified hitter (130th out of 144, to be exact). All that said, Phillips was worth about a win in 2017 per Baseball Reference’s version of WAR, while Fangraphs was a bit more bullish at 1.6 WAR. In all, he’s a career .275/.320/.421 hitter in nearly 8,000 big league plate appearances. Morosi notes that Phillips has been working out at Georgia Tech while hoping for an opportunity, though it stands to reason that he’d likely need some minor league or extended spring games to ready himself for another run in the Majors. While the Yankees have been trying to trade for a starting pitcher recently, Joel Sherman of the New York Post argues that the infield should be a greater priority for the club. The Yankees have a full complement of starters on hand, after all, while they’ve lost second baseman Starlin Castro and the third base duo of Chase Headley and Todd Frazier since last season. With that in mind, Sherman runs down a host of veteran infielders the Yankees could add either via free agency or the trade market. Notably, Sherman senses that the Yankees have never been bullish on free agent infielder Brandon Phillips, which would seem to rule out one potential target. Sherman goes on to suggest that the Yankees have had questions about whether Athletics infielder Jed Lowrie has the temperament to play in New York. So, while Lowrie looks like a prime trade candidate, it doesn’t appear he’ll end up in the Bronx. Rob Bradford of WEEI explains why the Red Sox’s interest in Orioles infielder Manny Machado is unlikely to lead to a deal, contending that the two sides don’t match up well in a trade. The Red Sox already have a quality shortstop in Xander Bogaerts, whom they could theoretically package with a pitcher(s) to land Machado, but that would perhaps be too risky on the team’s part. Machado is only under control for another season, while Bogaerts has two more years left. What’s more, the Red Sox don’t seem to have the high-level pitching to entice the Orioles, as Bradford notes that top prospects Jason Groome. Tanner Houck and Bryan Mata haven’t gotten past the Single-A level yet. The Red Sox haven’t participated in the robust relief market this winter, and it’s likely to stay that way until they have an answer on free agent slugger J.D. Martinez’s future, Jason Mastrodonato of the Boston Herald writes. If Martinez signs elsewhere, the Red Sox could use some of the money they were going to give him on relief help, observes Mastrodonato, who points out that their righty-heavy bullpen could use some balance. Tony Watson and Brian Duensing are among the top southpaw setup men currently without teams. 10:59pm: The Braves have now formally announced the trade. 10:17pm: Braves GM John Coppolella has acknowledged the deal to David O’Brien of the Atlanta Journal Constitution (Twitter links). While there’s been no formal press release announcing the swap, Coppolella tells O’Brien that the Angels were the ones who approached the Braves on the deal. Atlanta felt it was a chance to reward Phillips by allowing him to receive the $500K trade assign bonus in his contract and also get a chance to play in the postseason. 10:08pm: Phillips’ contract calls for a $500K assignment bonus in the event that he is traded, and the Angels will be responsible for paying that sum, Bowman tweets. 9:55pm: The Angels have swung a deal to acquire infielder Brandon Phillips from the Braves, according to Ken Rosenthal of The Athletic (via Twitter). Reports earlier today indicated the sides were close to a swap, with the only hang-up being whether Phillips would accept the deal. (He could block a trade to the Halos and eleven other teams by the terms of his contract.) According to MLB.com’s Mark Bowman, the Angels are sending former big league catcher Tony Sanchez to the Braves in return (Twitter link). Phillips recently shifted from second base to third base in Atlanta to accommodate the promotion of presumptive second baseman of the future Ozzie Albies, but he figures to slide back to his natural position of second base in Anaheim. While he’s no longer the offensive force that he once was, Phillips and his .291/.329/.423 slash line will be a marked upgrade for an Angel club that has seen its second baseman post a collectively abysmal .196/.271/.318 batting line in 2017. While Phillips represents an immediate upgrade to the Angels’ Wild Card chances in the American League, he’s as pure a rental as they come; the three-time All-Star and four-time Gold Glover will hit free agency following the 2017 season. However, by acquiring Phillips on Aug. 31, the Halos have ensured that he’ll be eligible for their postseason roster in the event that they do ultimately secure a Wild Card berth. At present, they’re 1.5 games behind the Twins for the second slot in the American League and 2.5 games back of the Yankees for the top Wild Card slot. That Sanchez, a former top pick who has now been relegated to journeyman status, is the return for Phillips speaks to the fact that the veteran infielder did not carry significant trade value. The Reds shipped Phillips to Atlanta this offseason and picked up all but $1MM of his remaining salary, and the Braves will presumably shed that commitment while giving the 36-year-old Phillips a chance to return to postseason play — an opportunity he wouldn’t have been afforded in Atlanta this season. Sanchez has posted a .272/.355/.374 slash in Triple-A this season, and while he could conceivably be a September call-up, it seems unlikely that the Braves would carry him on the 40-man roster all winter. In all likelihood, his time with the organization will be limited. For the Braves, shedding Phillips provides a relatively nominal amount of cost-savings but also opens regular at-bats for younger options to prove themselves capable pieces of the future in the season’s final month. Albies was already penciled in at second base, while Dansby Swanson has demonstrated immense improvements at shortstop upon his recent recall from Triple-A. Johan Camargo, another young infielder who has taken a step forward with a successful, albeit BABIP-driven rookie campaign, could be in line for at-bats at the hot corner down the stretch. Atlanta could also use the now-vacated at-bats to take a second look at Rio Ruiz — a former fourth-round pick of the Astros that signed a huge bonus out of the draft and came to the Braves alongside Mike Foltynewicz as part of the Evan Gattis trade. While Ruiz underwhelmed in his first taste of big league action, he only turned 23 years old in late May and has shown a bit of pop in Triple-A this year. 9:01pm: While awaiting a decision from Phillips, the teams are still “working to finalize details,” ESPN.com’s Buster Olney tweets. Still, though, it seems the matter hinges on Phillips’s own decisionmaking, as Bob Nightengale of USA Today tweeted earlier. 7:00pm: The Angels and Braves are attempting to work out a deal that would send infielder Brandon Phillips to Los Angeles, according to Jon Heyman of Fan Rag (Twitter link). Phillips, who was a late scratch from the lineup tonight, is considering right now whether to accept a deal, Ken Rosenthal of The Athletic tweets. He can block trades to a dozen clubs; presumably, the Halos are one of them. Since cutting ties with Danny Espinosa earlier in the year, the Angels have relied heavily upon Kaleb Cowart at second base. But Cowart is slashing just .233/.289/.411 over 99 plate appearances on the year and has struggled badly of late. 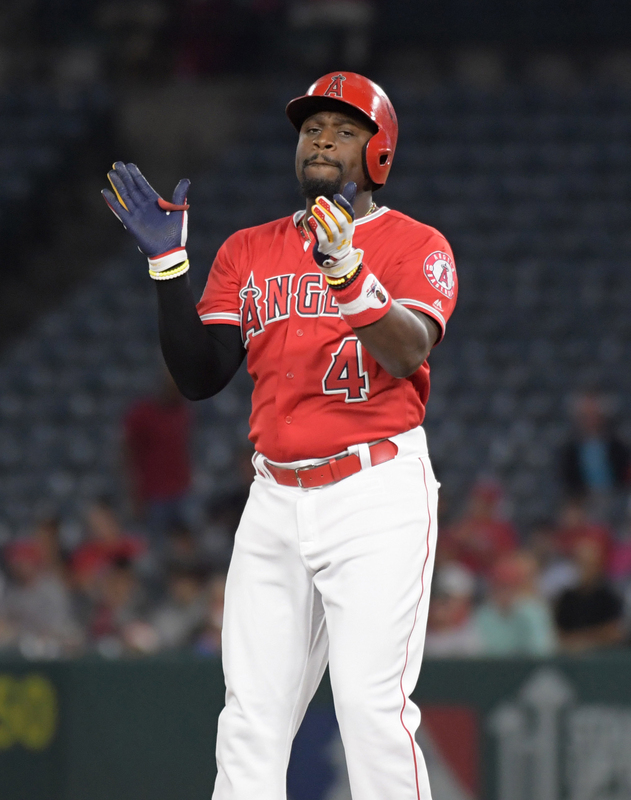 Having already added Justin Upton earlier today, the Halos are understandably looking to further bolster their lineup by targeting an area where they can make a relatively significant improvement at a marginal cost. Phillips, 36, came to Atlanta from the Reds over the winter. He’s earning $14MM this year, but Cincinnati is covering all but a million of that sum. With less than $200K left on the Braves’ share of the bill, Phillips is an affordable option — though he also would stand to take home a $500K assignment bonus under a clause negotiated when he approved the trade to the Braves. There’s also now some added versatility for the long-time second baseman, who has seen action at the hot corner for the first time this year. While he’s no longer a premium defender at second, Phillips is still a sturdy gloveman there and has drawn good reviews during his limited action at third. 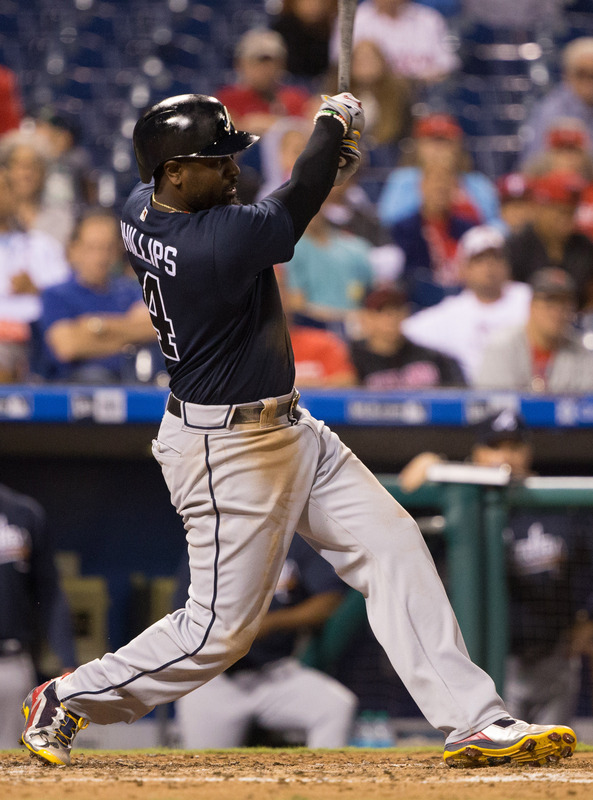 With his typical low-walk, high-contact approach, Phillips has posted a .291/.329/.423 batting line over 499 plate appearances, with 11 home runs and 10 steals. That’s right around the league average in terms of overall offensive productivity, just where Phillips has landed in each of the prior five campaigns. All told, though Phillips is far from a top-end second baseman, he has been a steadily useful player. For a team like the Angels, who have quite an evident need at second base, he could be quite a handy addition down the stretch and into the postseason.